In view of providing convenience to its customers, India’s National telecom backbone Bharat Sanchar Nigma Ltd (BSNL) all set to launch ‘My BSNL’ Mobile Application for Android and Windows smartphone to let its subscribers to pay bills, recharge and manage their Mobile, Land-line and Broadband services from mobile and tablets. 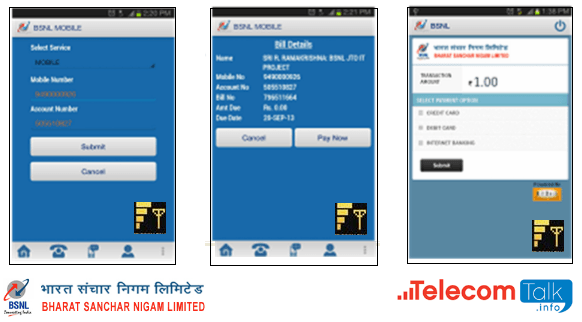 BSNL considers this mobile application is important to reach customers pro-actively in facilitating bill payments in Landline/Wireless (GSM/3G/CDMA/WiMAX – Post paid /Pre Paid) segments. In the present scenario for accessing e-services offered by BSNL, it is essential to visit http://portal.bsnl.in through Desktop/ Laptop. While ‘My BSNL App’ will enable the customers to pay Postpaid bills and Prepaid Top up on-line through their Mobiles and Tablets. BSNL’s goal with this mobile application is to provide Android /Windows Mobile/Tablet users a visually appealing, user-friendly application which facilitates a hassle free payment mechanism to either Prepaid mobile Top up /recharge, migration of new tariff plan, activation of new services or to pay Post paid bills. Official “My BSNL App” is free to download app and now available in Google Play Store for Android users in and Windows Phone App Store. I have replaced chip of my mob number at 11.30 am today from general I was assured that my number will remain the same and also my plan of 99 taken five yrs back will also remain the same.